I love food. One of the best things about travelling is having the opportunity to sample new restaurants and different cuisines. As you know, Rob and I have just returned from travelling in Portugal. We started in Lisbon, made our way north to Porto via Sintra, did a driving loop to visit three northern pousadas, and then returned to Lisbon. While we were in Lisbon, we we went down to the Bairro Alto, the old downtown core of Lisbon, for dinner the first few nights. This is a picturesque area of narrow cobblestone streets, traditional architecture, clubs, Portuguese restaurants, and fado singers. The area is filled with tourists. 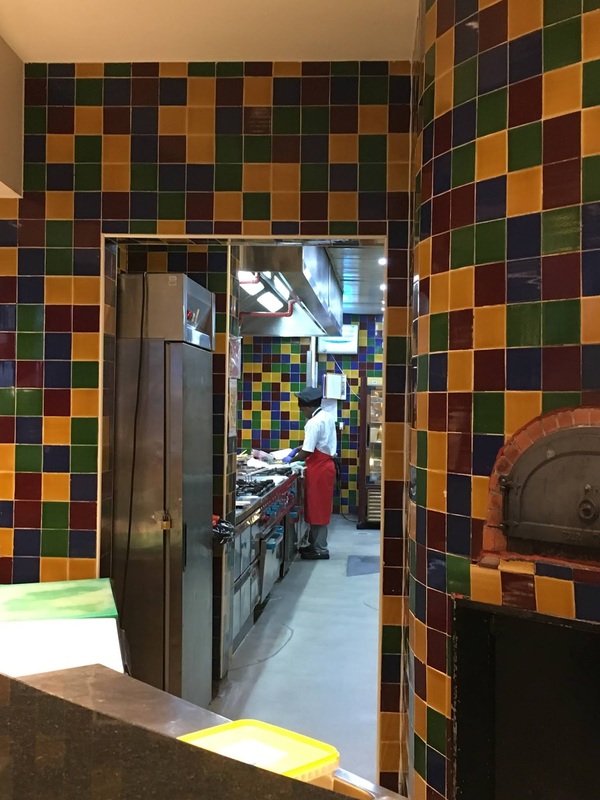 The restaurants here feature traditional Portuguese cooking, which I love. 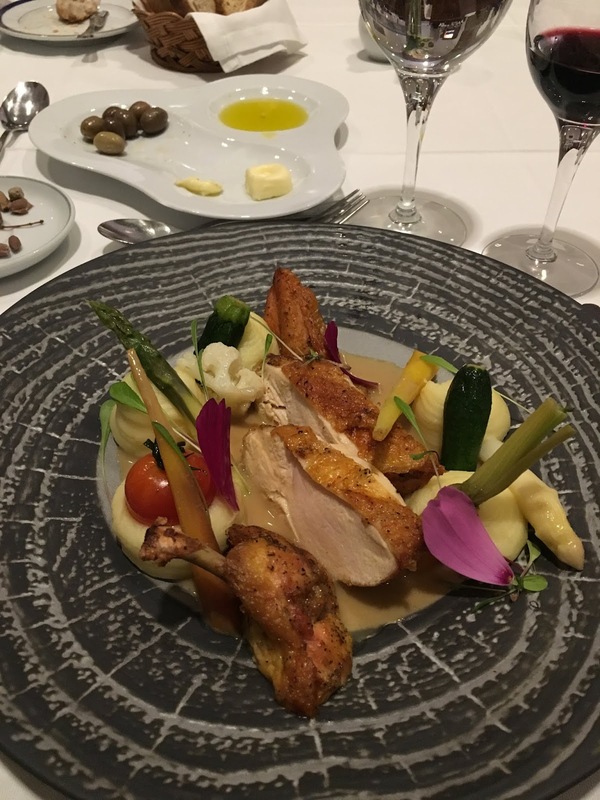 Rather than elaborately plated fine dining, the food is hearty in a "farm food" or "fisherman's food" kind of way, and menu items may be served "family style." This means that you order à la carte, and share with the table (the servings are large!). The photo below shows a rabbit pie that I ordered one night. It was fabulous! 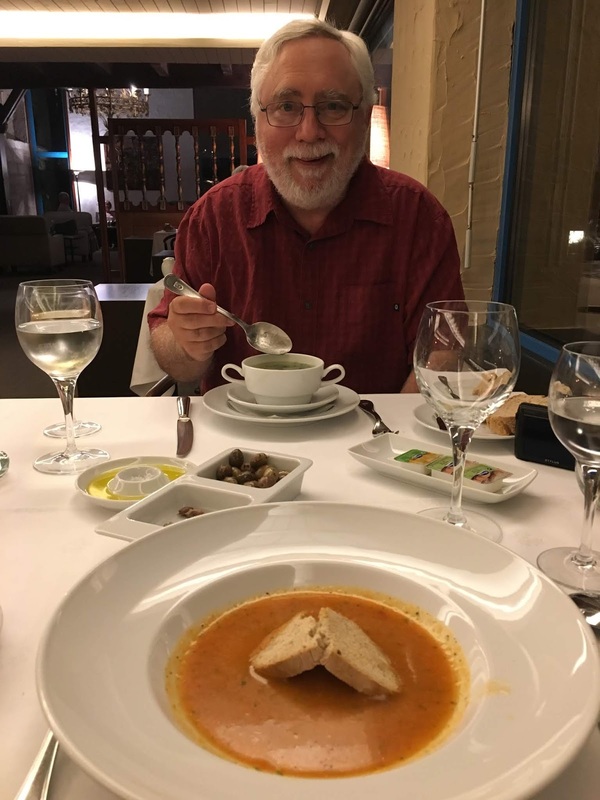 As a sea-faring nation, Portuguese restaurants offer many kinds of fish and other seafood on their menus, which made me happy. I ordered fish more often than not, whereas Rob indulged in all manner of meaty dishes. One of the most delicious dishes we shared while in Lisbon was an octopus salad (which I forgot to take a picture of, I was so intent on eating it). I can't write about traditional Portuguese dinners without mentioning the appetizers that are laid out in front of you when you first sit down. They always set out olives, bread, and soft cheese, along with a variety of other tasty items. They only charge you for the ones you choose to eat, and you can ask them to take the rest away. Our Portuguese friends tell us that experienced diners wave away the couvers (I am not sure about the spelling of that), but Rob and I discovered so many interesting dishes that we didn't always send them away. We ALWAYS kept the olives, as Portuguese olives are so much better than the ones you can get in North America. And so is the wine, but I am not going to write about the wine here, although we sampled quite a lot of it. On this visit, we also spent quite a lot of time exploring the newer part of the city around the Parque das Nações area. This is the huge area where the 1998 Expo was held. It has all been developed into an area of public parks and public buildings, restaurants, museums, and so on, and also there is a huge shopping mall there. It was interesting to experience modern Lisbon culture and more contemporary cuisine in this area. Although our hotel was near the airport, it was easy to get anywhere in the city via the Metro. Each day, we bought a daily Metro pass for 6,30 Euros, and with that we could ride anywhere on the Metro trains, and transfer to buses as well. All of the pousadas and other hotels that we stayed in (except the little pension in Sintra) came with a full breakfast buffet. The three pousadas all offered spectacularly good breakfasts, and so did the Lisbon Marriott hotel, where we stayed on our last night in Portugal. The pastries in Portugal are divine, and there were always many freshly baked pastries on offer for breakfast, as well as in every coffee shop. There are many regional specialties (which we did our best to sample), but I think my favourite is Pastel de Nata, an egg tart pastry that is considered to be the national pastry. 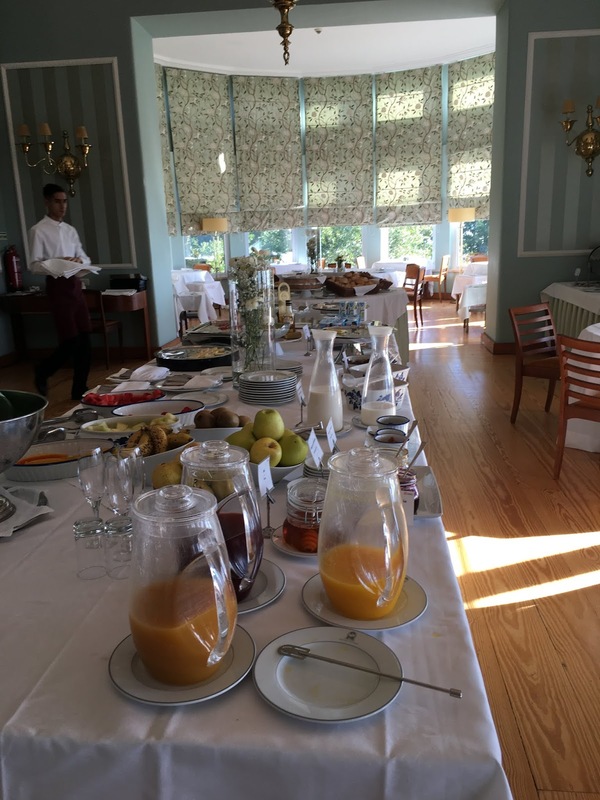 The photo below shows the breakfast table at the Pousada Viana do Castelo. Not only was the breakfast really good, but also it was a very beautiful dining room. The views out the windows over the city and ocean also were great, as this hotel is located on top of a mountain. The food was also good at the Pousada de Canicada-Geres. In particular, I enjoyed a really tasty gazpacho as my first course. Rob ate a cabbage and sausage soup, which he liked. 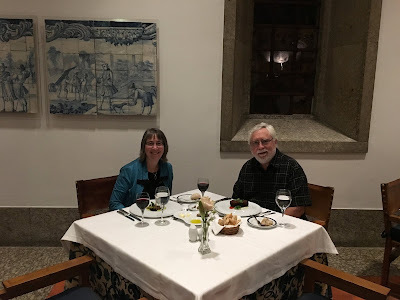 Our dinner in the Pousada Mosteiro de Guimaraes was perhaps the most "haute cuisine" meal that we enjoyed. The first photo below shows us sitting at our table, and the next one zooms in on my chicken dish, which was as delicious as it was beautiful. I haven't mentioned the dessert buffet yet. Each pousada also offered a table groaning with the dessert selections, many being specialties of the area. How could we have room for dessert after appetizers, soup, and an entrée? Somehow, we managed. If you are thinking of going to Portugal, one thing you should be aware of is that people dine late there (by North American standards). Most restaurants do not open for dinner until 7 pm, and more fashionable diners tend to eat even later than that. If you get hungry in the late afternoon or early evening, it can be hard to find any place open even for a snack. On our first trip to Lisbon in 2011, we stayed at the Lisbon Marriott. We both remembered the breakfast buffets there fondly, and when we returned there on this trip, it did not disappoint us. In Porto, we dined at outdoor restaurants along the quay each night. It was lovely to look out across the river at the twinkling lights, sipping wine and enjoying our dinners. 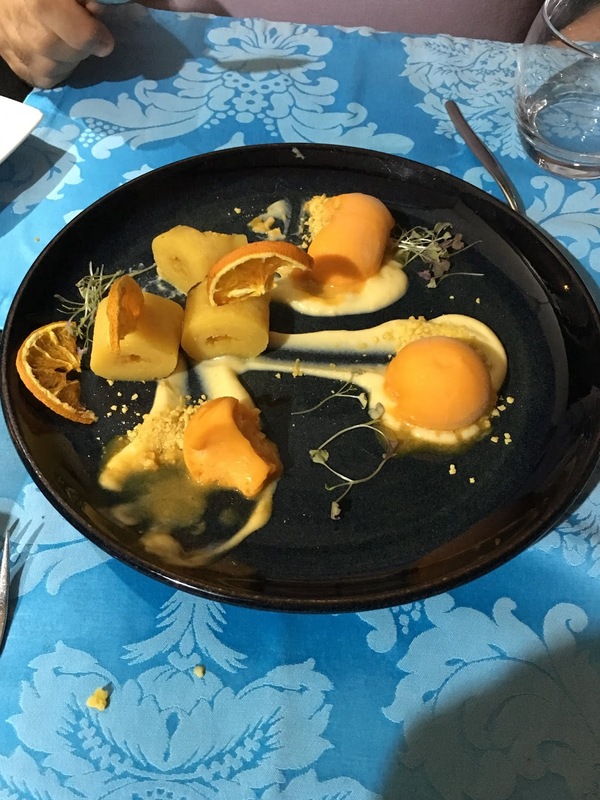 I will leave you with a final photo of a dessert we shared in Porto. It looked even prettier before we started to eat it! Awww, Jude - This post has made me VERY hungry! I LOVED the food in Portugal when we were there last year. I don't remember the appetizers being laid out in front of us. Did that happen at ALL of the places that you ate? I do remember the LATE dining hours...which was the only drawback for me. I look forward to catching up in person and hearing more! 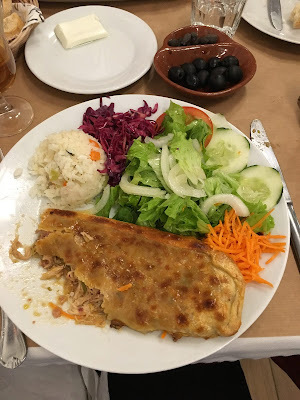 Yes Donna, we really enjoyed the food in Portugal, and the meals were good almost without exception. The only dinner that I can recall where they did not bring the array of appetizers was our dinner in the hotel the first night that we arrived. But that was because the hotel offered a buffet dinner. It was also one of the only meals that we had that was not especially good. But we enjoyed the experience anyways, as there was a men’s church choir from Germany eating in the restaurant, and they decided to sing several selections late in the evening. You certainly ate well! Finding good food is always a highlight for me too. Yes, good food is one of the great joys in life! I loved the food in Portugal when I was there, too, Jude. I could eat their Pastel de Nata every day if it wasn't for keeping my weight and cholesterol in check. Natalie, I have to admit that my usual eating habits went out the window during this trip. Quite possibly, I did eat at least one Pastel de Nata tart every day that I was there. The only thing that I can say in my defence is that we easily walked our 10,000 steps every day, and climbed quite a few hills. I'm not familiar with Portuguese food, but I love to drink port. :-) Your post and photos made me hungry as well. It's almost lunch time, so that doesn't help. Thanks for the insight in Portuguese cuisine. I'd be all over those seafood dishes and breakfast buffets. It sure sounds and looks like you pleased many senses during this visit! Liesbet, I was not familiar with Portuguese food either until our first trip there in 2011. It was a happy surprise! That first trip there was also my introduction to port, which I enjoy very much. However, it wasn’t until we did the port tasting tour on this trip that I learned how many different kinds of port there are. Did you know that there is white port? I tasted some white port, but I still prefer the ruby and tawny ports too. I was astounded at the affordable prices of the port and red wines in Portugal. A red wine from the Douro, Dao, or Alentejo regions of Portugal that we would pay $20-25 CAN here were the equivalent of $6-10 there. Also, there were so many varieties of local wine that we don’t even see in the stores in Canada.